This year, the Fortune 500 welcomed 20 new companies to its list. Two of those companies were created in the past year. Pretty incredible, right? The rapid success of these companies, and many more, can be partly attributed to salespeople. The majority of businesses depend on a talented sales force to grow, and yet, there are very few preparatory programs for people entering sales. This is a vulnerability for companies whose future success relies on their ability to close the right types of leads. We’ve recently published two eye-opening reports covering the state of the sales business and the education and training programs of those working in the industry. Continue reading to learn more about the needs of sales professionals and the evolving industry. 1) 46% of salespeople didn’t intend to go into the sales profession. According to the Department of Labor, there are about 9 million people in non-retail sales roles in the U.S. alone. That’s roughly 2.8% of the population. However, when we asked our respondents, only 39% said they intended to go into sales. 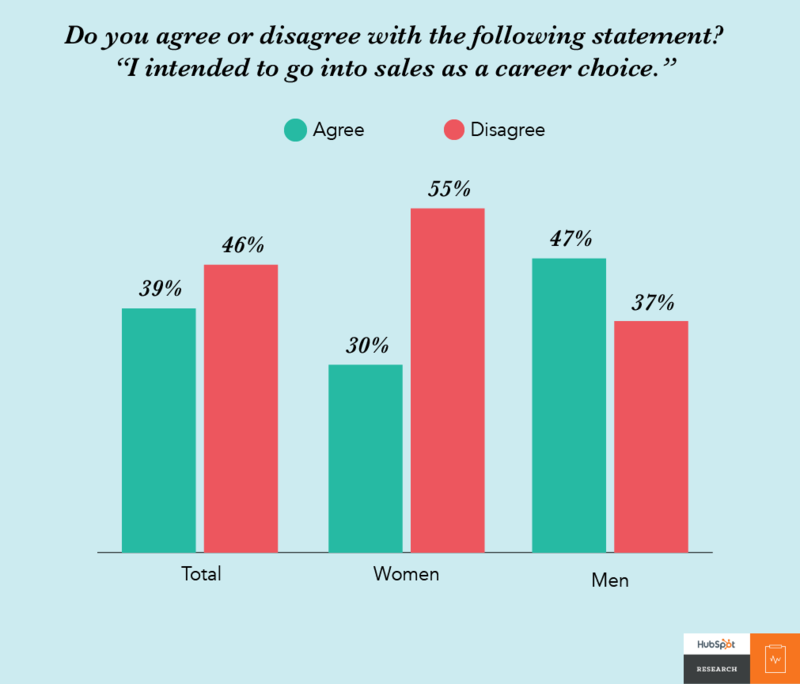 The results varied greatly by gender -- just 30% of women intended to go into sales compared to 47% of men. 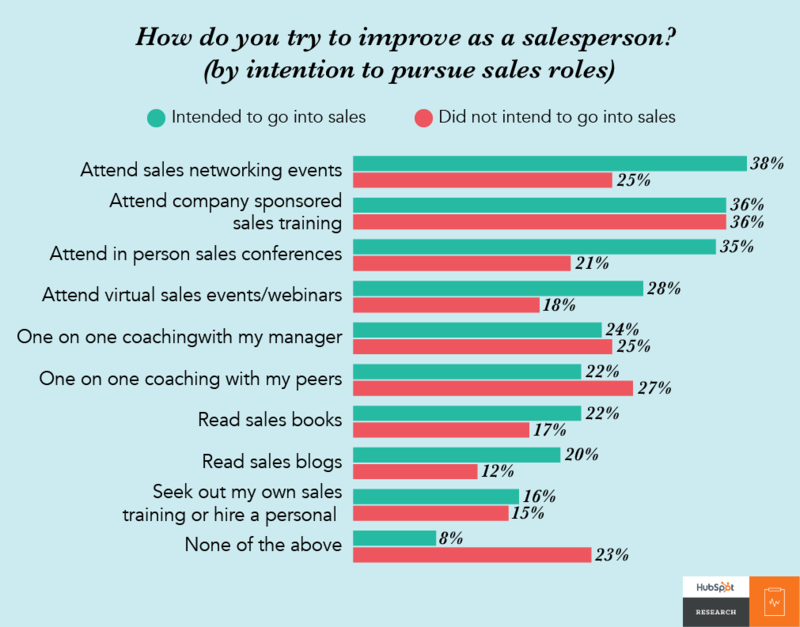 2) Those who did not intend to pursue sales are less likely to seek training outside of work. Because people enter sales with no formal training, we asked our respondents where they pursue new training and learning opportunities. 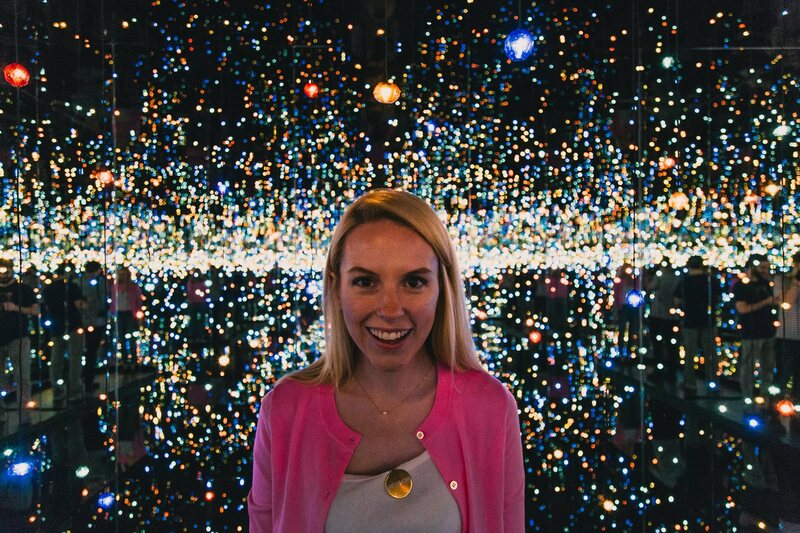 We discovered that salespeople that intended to go into sales enjoy going to outside sales conferences and networking events, while those who did not rely heavily on 1:1 coaching or in-house training. This reliance on managers for coaching is most prevalent among women. If a manager is unable or unwilling to mentor their sales reps, female salespeople will be affected the most. 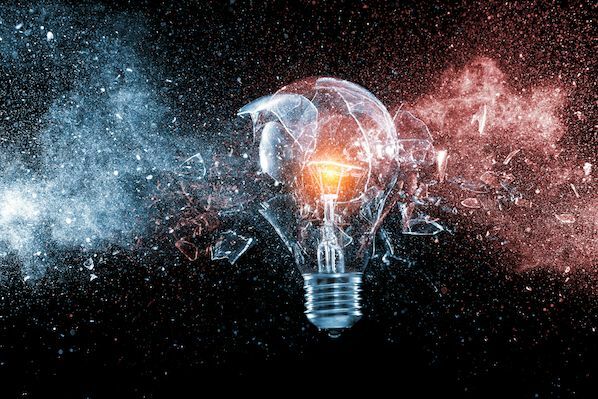 Considering that 46% of salespeople didn’t intend to go into sales, companies should consider dedicating extra resources to training their sales staff so they feel ready and empowered to succeed. 3) Salespeople spend a significant part of their day on administrative tasks. We know that salespeople are hired to sell, but is that how they spend most of their time? We found that sales professionals spend a significant portion of their day on administrative tasks. 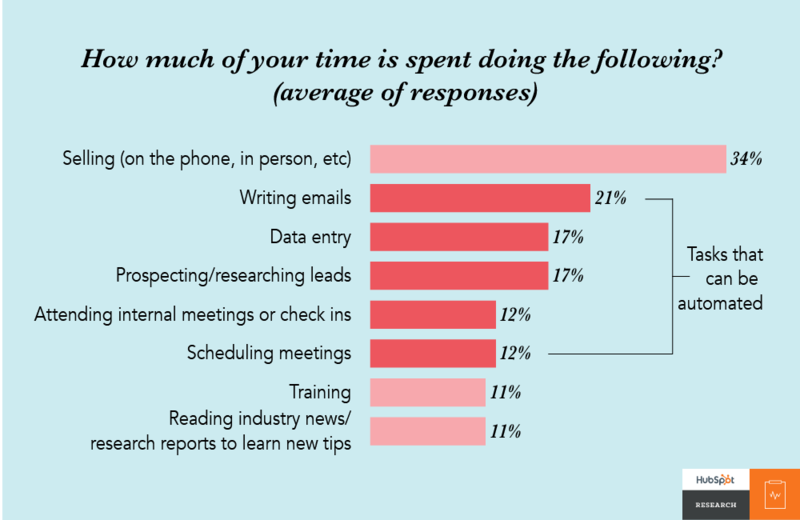 While they do spend a considerable amount of time selling, the majority of their day is spent writing emails, performing data entry, prospecting, and scheduling meetings. Fortunately, there are many free tools that can help reduce the burden of administrative tasks so salespeople can stay focused on reaching their goals. 4) 17% of respondents did not attend a four-year college. Since there isn’t a college major for sales, we were curious to learn what salespeople studied before entering the workforce. 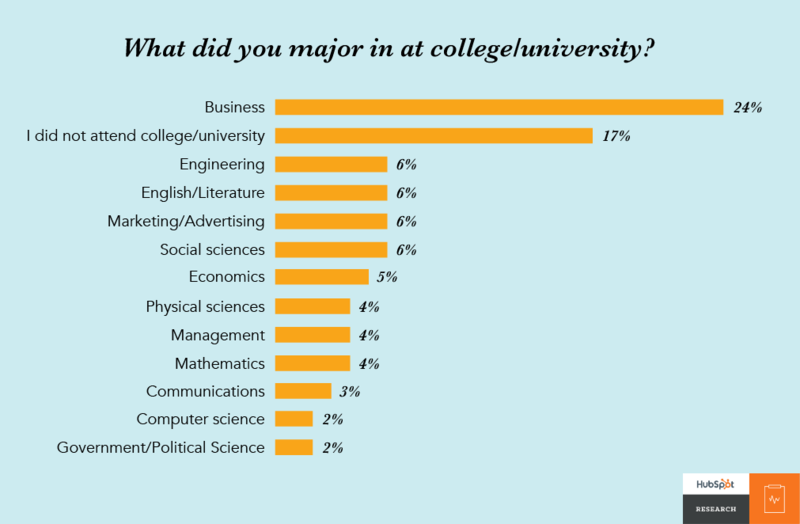 Based on our respondents, we found that 24% of salespeople majored in business and many others had a background in engineering, liberal arts, communications, and math. Furthermore, we learned 17% of respondents did not attend a four-year college. 5) Closing more deals is a top sales priority. 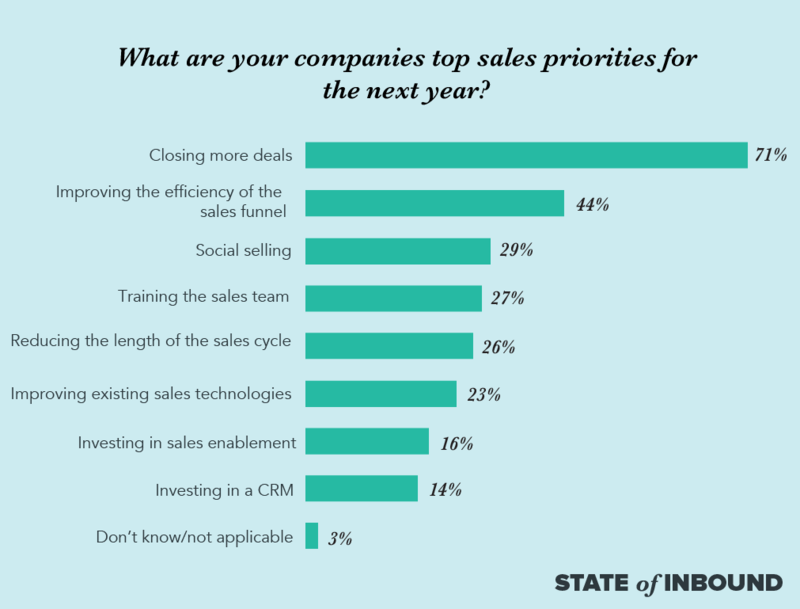 According to State of Inbound, 71% of sales professionals say closing more deals is their top priority. This was followed by improving the efficiency of the sales funnel (44%) and social selling (29%). However, 28% of salespeople believe closing deals is the most challenging part of the sales process for reps, signaling a need for new or additional training. These top priorities and selling strategies would require a major shift from businesses and salespeople. This could pose a bit of a problem because our most recent research shows that once salespeople find a selling method that works for them, they stick to it. 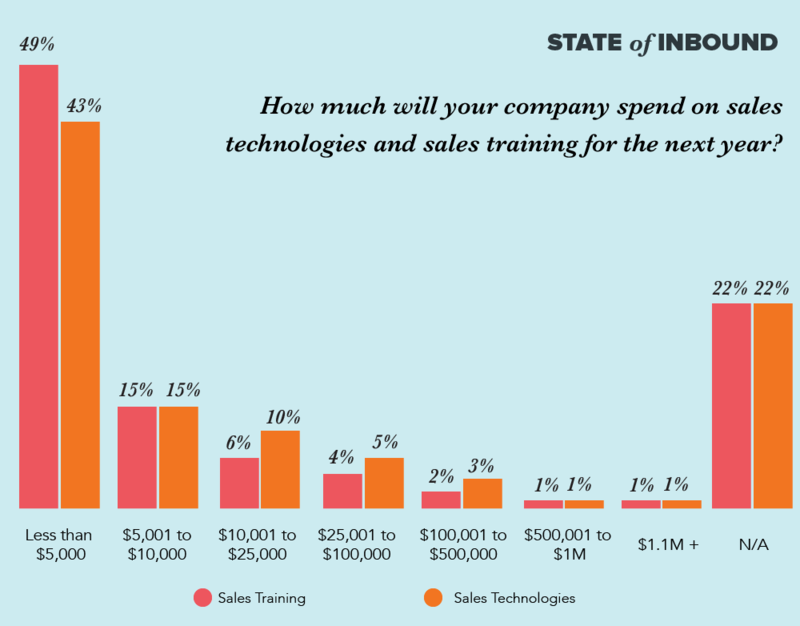 6) Most expect to spend $10,000 or less this year on sales technologies and training. A large portion of salespeople didn’t intend to go into sales, don’t attend external trainings, and spend the majority of their day on administrative tasks. In spite of this, most companies expect to spend less than $10,000 this year on sales technologies and training. 7) Sales people aren't trusted in the buying process. 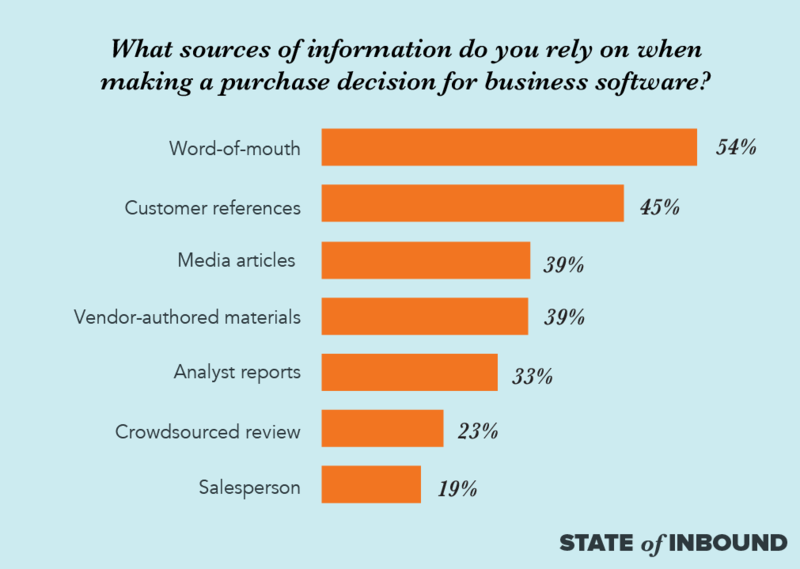 When we asked businesses what information they rely on when purchasing a business software, a salesperson was the last source of information. It's important for sales to work with marketing to get access to third-party reviews, vendor guides, and more. This will help ensure that the best quality leads are being passed along. Is your business investing in additional sales tools and trainings? Let us know what’s helped you and your sales team meet your goals!